Start by hearing a story by Sara Weinreb about the intersection of health and entrepreneurship, the struggles, and ways to progress in a positive manner. Next we have a guided mediation with both group and hands-on work by Reiki Master Kelly Keefe. 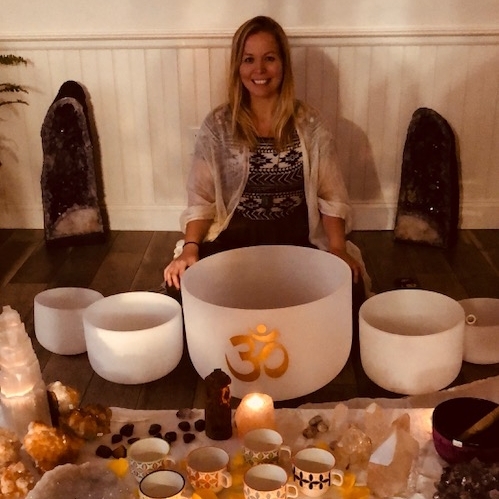 The event concludes with networking, holistic beverages, treats, and other ways to bring wellness and peace into your work and entrepreneurship. Sara Weinreb is a strategist, facilitator, and writer, as well as a total design thinking nerd. She serves as contributing writer to Forbes, mindbodygreen, and various other publications on the topics of business for social impact as well as mindful and sustainable living. She is the Founder of The M List. She formerly founded IMBY, an ethical fashion retail brand. Sara has facilitated entrepreneurship and design thinking workshops around the country and world, and previously served as Vice President of Programs and Strategy at PresenTense, a social entrepreneurship accelerator. Sara is passionate about sustainable living, health and wellness, and yoga, loves karaoke, and believes all dessert must include chocolate. Leesa is a direct-to-consumer online luxury mattress company that offers American-made mattresses delivered directly to consumers' doors. From its start, Leesa has measured its own success not just by the bottom line, but by the company's overall social impact. To date, Leesa's One-Ten program has provided more than 26,000 mattresses to those in need. Leesa offers a 100-night risk-free trial, free shipping and no-hassle returns. In 2016, Leesa was recognized as a certified B Corp, joining forces with more than 2,100 companies using business as a force for good. Diversability is an award-winning global movement to rebrand disability that began in Washington, DC with Tiffany Yu in 2009. We foster community online and off to connect, showcase, and empower people of all abilities doing amazing things. We want to get more people talking and thinking about disability as a core part of the diversity conversation. We unite the disability community, engage allies, and celebrate disability pride and empowerment. Emmy's Organics is a gluten-free, vegan and organic snack company that creates organic coconut cookies made with the highest quality ingredients. Emmy’s Organics is not only delicious but the perfect energizing, guilt-free treat!